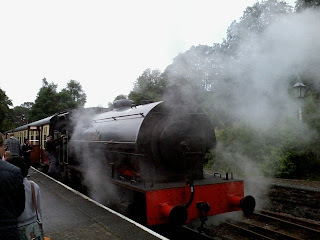 Having taken the M/V Swan across Windermere, we then alighted to catch a steam train from Lakeside up to Haverthwaite. Steam locomotive "Repulse" pulls in to lakeside railway station. Alighting the train at Haverthwaite. 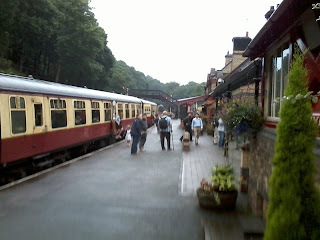 Note: there was a discussion about the "thwaite" part of the name Haverthwaite. Apparently it is, as we guessed, of norse origin. It comes from þveit meaning a clearing or open space of land.